Ch ild Advocate, Guardian Ad Litem, Gainesville, Florida. 1987-1989. Victim advocate for abused and neglected children, including victims of sexual abuse. Domestic Violence Victim Advocate, Executive Director, and Trainer: Sexual and Physical Abuse Resource Center, Gainesville, FL. 1989-90. Part of my job was to provide educational programs about domestic violence to local citizens, law enforcement, victim advocates, and medical professionals. Associate Director, Victim Offender Reconciliation Program Information & Resource Center: 2003-2007. Case management and preparation of victims and offenders for dialog in murder cases. Restorative justice consulting, victim-offender mediation, training and program development at the national and international level. Educated Departments of Corrections about programs being created for families of murder victims to face the killers of their loved ones. 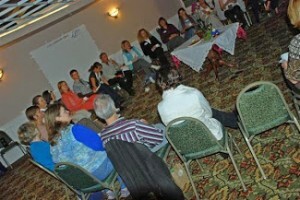 Attended National Conferences on Restorative Justice in Texas in 2007 and 2009. Circlekeeper: I have led Circles in various contexts and have taught basic Circle processes plus conflict resolution skills, deep listening. My work tends to be in using Circles to know each other better and to gain understanding of common values and goals so we can work together. Examples of groups I have been associated with doing Circles include the Florida Bar Elder Law section, classes at Warren Wilson College, and many retreats led in Circle. 2003-present. Background Consultant: In 2003, I was consulted by a producer for Oprah regarding a show on restorative justice. I spent a couple of hours on the telephone educating the producer, laying groundwork for what was eventually a very successful program. Bringing Restorative Practices to the Hard Nosed Business Community – Shifting Corporate Culture by Embedding Restorative Practices, with Randy Langford, Linda Alvarez, and Kristin Scheel. National Association of Community and Restorative Justice conference. Oakland, CA. June, 2017. Lawyers as Peacemakers, National Association of Community and Restorative Justice conference. Fort Lauderdale, FL. June, 2015. Presenter, Peacemaking with Victims and Offenders, Annual Dispute Resolution Center Conference for Mediators & Arbitrators: August 25-27, 2011, Orlando. Taught two semesters of Restorative Justice and one of Business Law, using experiential learning approaches, including Circle Process. Supervised student independent study in applying Appreciative Inquiry and Restorative Justice to campus issues. The New Lawyer, Harvard Negotiation Project Insight Initiative, Harvard Law School, 2007. Arriving as a participant at HNII week-long program, in recognition of my experience, I was invited to help co-teach the sections on Restorative Justice and Collaborative Law. In collaboration with Marty Price, I created all presentation materials (PowerPoint, hand-outs, manuals) for a US State Department-sponsored speaking and training tour to introduce restorative justice to Chile and Argentina. My colleague received two Fulbright grants and an appointment at John F. Kennedy University of Argentina Law School in Buenos Aires, where he delivered the materials in the PhD program and various other programs in the region. Community Justice Program, Yuma County Attorneys Office, Restorative Justice Community Conference and Working Effectively with Victims & Offenders, Co-Leader, Yuma, Arizona, 2006. Trainees included prison officials, victim advocates, prosecutors, counselors, and community leaders.